Sonic the Hedgehog Genesis, simply referring to itself as Sonic the Hedgehog in game, remake of the original Sonic the Hedgehog for the Game Boy Advance. It was released as part of the celebration of the 15th anniversary of Sonic the Hedgehog, but the game was only released in North America. 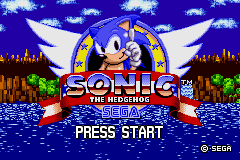 5.2.1 Sega of America, Inc.
Sonic the Hedgehog Genesis is an attempt to bring the first Sonic outing to the Game Boy Advance, but while many art assets are shared, the game engine is completely different and much of the audio far simpler. Content-wise it is similar to the first game, however the spin dash move from Sonic the Hedgehog 2 can be used in a new "anniversary mode". The game also includes battery back-up saving, allowing for players to easily revisit finished stages. While some graphics have been altered to better suit the Game Boy Advance's screen resolution (240x160, versus the 320x224 used on the Mega Drive), much remains the same as the 1991 game, meaning less of the play area is visible at any given time. This makes Genesis a harder title, as it is harder to see what lies ahead. Cheat codes from the Mega Drive game were not ported over. Beating the game unlocks a jukebox mode to hear the game's music. Collecting all six chaos emeralds adds sound effects to the jukebox. Genesis was widely criticised on release for being an unfaithful representation of the original game. Its engine is not accurate, with "weightier" jump physics making it difficult to clear some gaps, and different rates of acceleration/deceleration meaning Sonic can stop almost instantly. Sonic also bounces back further after being hit, and can react strangely to certain objects, slowing down the pace of play. Most notably, Sonic the Hedgehog Genesis very rarely holds a consistent frame rate, slowing down whenever too many objects are on-screen. This variation on performance severely affects character handling, making some platforming sections trickier than they should be. Sprites positioned partially on-screen are often not rendered at all, meaning larger objects pop in more abruptly than on the Mega Drive. Effects such as collapsing platforms and breakable walls are are also simplified. The audio is cut back, with simpler renditions of Sonic music being generated by the Game Boy Advance hardware. Some sound effects are sampled from Mega Drive hardware, but most are also generated, this time from simple square waves and a noise channel, akin to the average (monochrome) Game Boy and Game Boy Color game. Some sound effects are completely missing. Within just a few months of release, Sonic Retro community member Stealth released Sonic the Hedgehog GBA, a more accurate conversion of Sonic the Hedgehog to Game Boy Advance hardware. Stealth would later be hired by Sega to help produce the 2013 port of the game (and later Sonic Mania). Special Thanks: Fujio Minegishi, "Papa"